crepes! 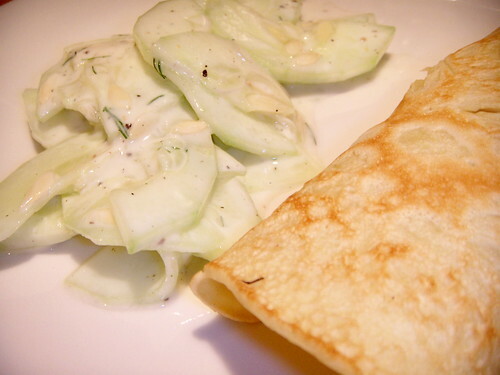 : dumpling crepe with yogurt cucumber and dill salad, originally uploaded by aarn! +14th August, 2008+. had originally planned to make some neat raw vegetable filled steamed dumplings, but had to change paths when the dumpling dough ended up being too brittle to work with. made a filling with some re-hydrated tvp (which had been re-hydrated with dried black trumpet mushrooms in a bowl of boiling water and then strained, kind of took on the mushroom flavor), black trumpet mushrooms, the meaty parts of garden fresh zucchini, and tomatoes, seasoned with garlic, anise, cinnamon, a spoon of the hot pepper jelly, cayenne, orange zest, a little cardamom, fresh ground ginger, a spoon of soy sauce, crushed peanuts, a spoon of sesame oil, and a pinch of rice four. made the crepe on medium heat in a flat pan with batter consisting of 1c. flour, 3 eggs, 1c. water, a pinch of salt, splash of oil, and a pinch of sugar, whisked up and cooked until firm and crispy on the bottom in light oil. salad was peeled/sliced garden fresh cucumber tossed in yogurt, salt, pepper, and dill.